Camp is Monday to Friday, and we will spend almost the entire time riding. Guaranteed one hour skill based lesson each day followed by various mounted activities such timed barrel racing, poles, obstacles, trails, team penning (new this year), cowboy polo, relay races, horse shows, trail rides, wooded trails, and more. Maximum of 10 riders per week means lots of personal attention and more riding time. 8 years old and up, no riding experience required, jeans and boots required. Bring your own snack and drink. Water provided. Also enjoy seeing the ranch animals including cattle, donkeys, goats, chickens, rabbits, ducks, and 15 horses. Cost: $300 for day camp (4 hours) $150 for evening camp (2 hours) Sign up now to reserve your slot. 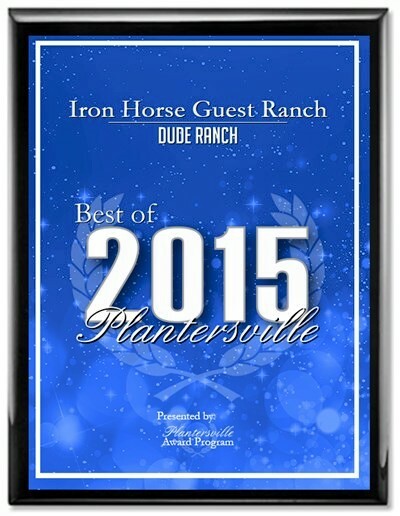 Email us at info@ironhorseguestranch.com with the preferred week, name, age, and experience level of your rider(s). Deposit of $50 to hold your slot (Transferable, but not nonrefundable.) Cash or check only, credit cards not accepted. *Minimum of 4 camper per week. Beautiful scenery, cozy cabins fully furnished and equipped with kitchenette. Sleeps 7 comfortably. Reservations required. Age 6 and up, 1 hour riding lesson. Western, English, or Australian riding styles in the arena, riding ring, obstacles, or trails. We teach horsemanship, caring for the horse, and tacking. Enjoy the ranch like the pioneers did. Mule drawn wagon. Our Belgian Mules, Bill and Bob, love carrots. 2 different wooden wagons available. Seats 12 adults. One hour trail ride through the trails, no experience necessary. Ride a horse independently. Short lesson followed by the ride. Jeans required, minimum 4 riders, 8 years old and up. We will have multiple groups up to 8 riders on the same trail ride. For a private ride, minimum of 4 riders at $50 each. Trail ride must be booked a minimum of 24 hours in advance with a $50 nonrefundable deposit.